They've got ribs, lamb, and pork belly, to start with! Open daily from 11 a.m. to 2 p.m. and 5 p.m. to 12 a.m.
(SPOT.ph) There are restaurants that you enjoy the first time you try them, but somehow, you don't find yourself ever going back. There are those that you walk past all the time but don’t pique your interest. 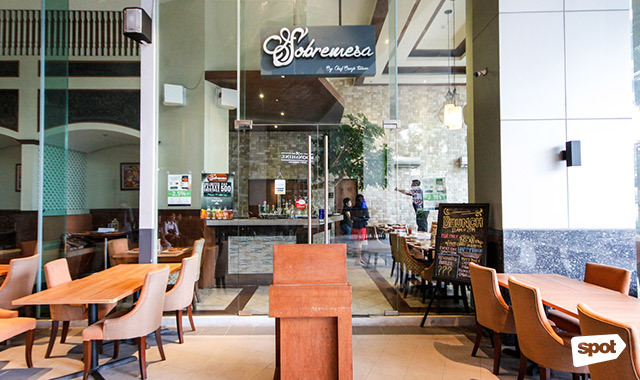 Then, there’s Sobremesa, an intriguing, homey eatery that compels you to come back time and again. When they first opened their doors in November 2015, they were swarmed for their dishes that marry South American and Filipino flavors in a rich, ever-evolving menu. With their practice of constantly innovating and playing around in the kitchen, Sobremesa keeps guests on their toes. This month, they launched a new menu, complete with bold, flavorful entrees, set selections, and mouthwatering desserts. 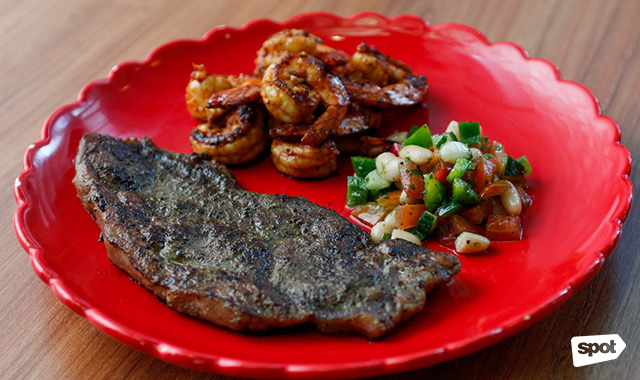 Start off with the Carne Y Gambas (P720), a tender piece of sirloin steak sautéed in chili and white bean salsa for a fiery yet zesty lift. The Shrimp Poppers (P400) are great to munch on—fresh shrimps fried in a crumbly, light batter that’s more addicting dunked in the jalapeño sauce. 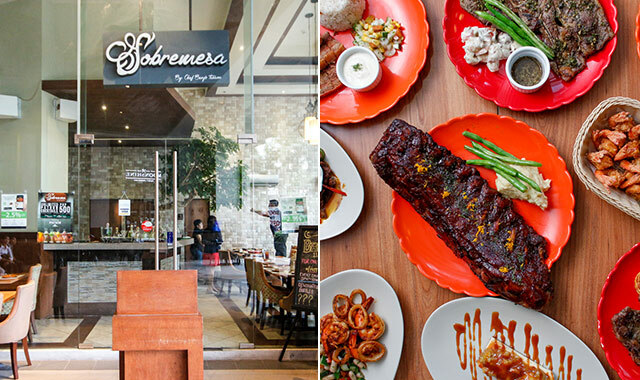 The Sobremesa Ribs (P1,000/whole, P500/half) are the restaurant’s newest banner dish. 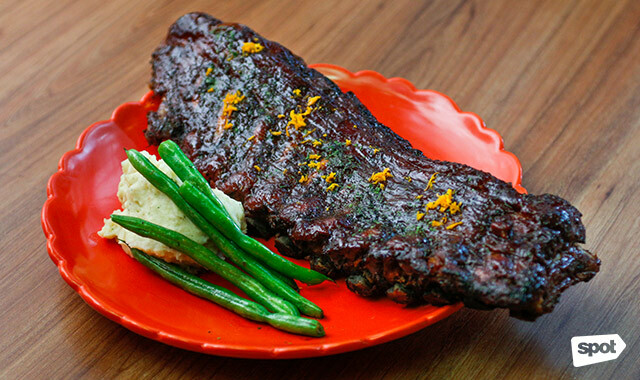 “We brine the ribs for a day, marinade it for a day, then bake it for two-and-a-half hours,” explains executive chef and co-owner Benjo Tuason. “While baking, it’s wrapped in a foil pouch to trap all the flavors, while also letting the steam cook the ribs gentler but further.” Generous helpings of barbecue sauce coat the massive slab, served with—what else—roasted garlic mashed potatoes on the side. 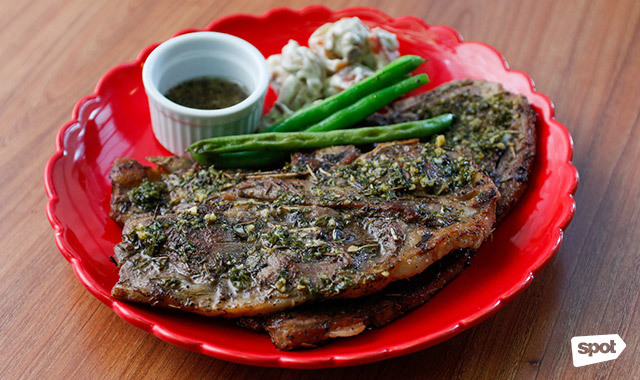 Carnivores won’t be able to resist the Grilled Lamb Steak (P565)—a lip-smacking piece of succulent lamb marinated for hours and served with green Chimichurri sauce, an herb-based condiment bursting with flavors. It's garlicky, piquant, and refreshing—all at the same time. At the Sapphire Bloc area where mostly office folks and students roam, set lunch menus make choosing your meal convenient. Sobremesa has come up with five new lunch selections available every day from 11 a.m. to 2 p.m. 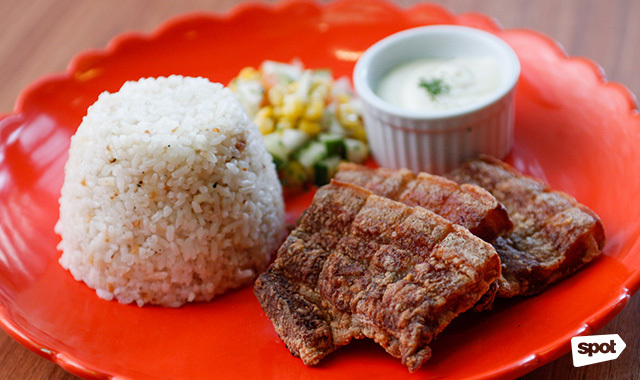 The Bistek-Style Bangus with Salted Egg and Tomato Salsa (P250) is a familiar dish. 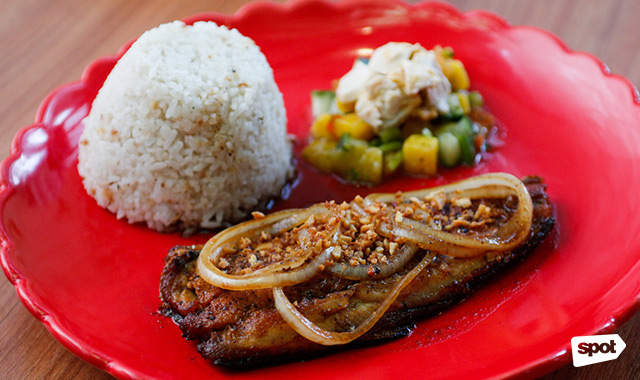 The fish, cooked to perfection, is complemented by the tangy notes of salsa and creaminess of salted egg. If you want to eat with your hands in true Pinoy fashion, no one would judge! 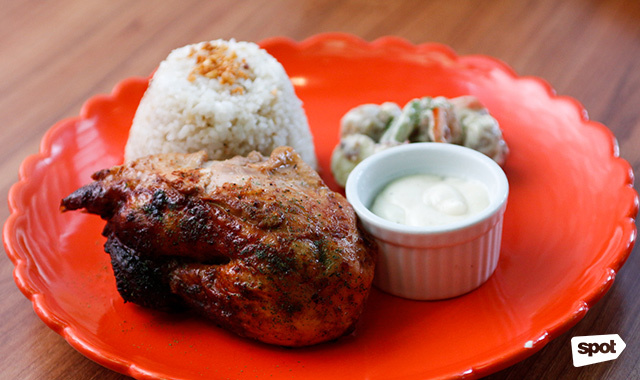 There’s also the Peruvian Spiced Roasted Chicken with Potato Salad (P250), a smoked, juicy quarter punctuated with peppery tones which pairs well with the buttery, skinned baby potatoes. 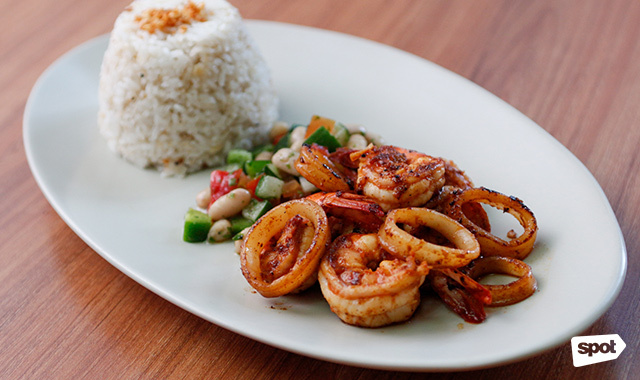 For a heavier meal, the Deep Fried Pork Belly with Corn Salsa (P250) or Sautéed Seafood with Chili Garlic Butter and White Beans Salsa (P250) will do the trick. 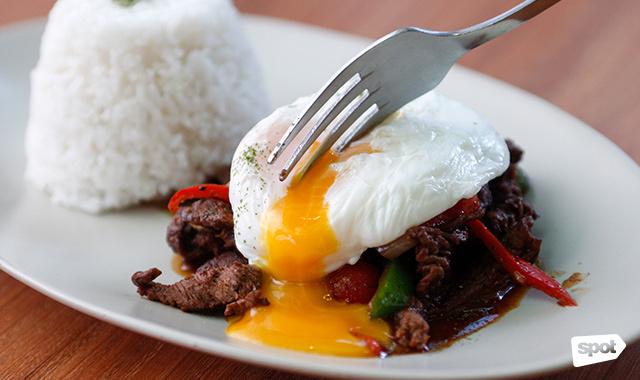 Thin slices of sirloin beef stir-fried until tender makes the Stir-Fried Beef and Peppers with Poached Egg (P250) an easy favorite, with the simmering poached egg on top giving a delightful, runny show. 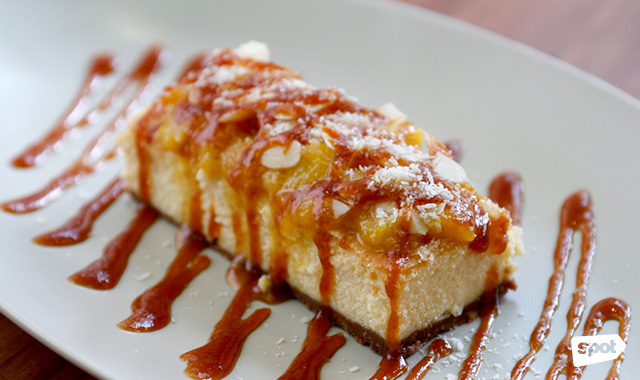 Cap off your visit on a decadent note with the Salted Caramel and Banana Cheesecake (P220) and Mango Coconut and Almond Cheesecake (P220), both of which are made in-house from scratch. We’re partial to the latter; naturally sweet ripe mangoes drizzled on a velvety smooth bed of cream cheese. The dense graham crust—easy to mistake as chocolate—melts in your mouth in the most enjoyable way. 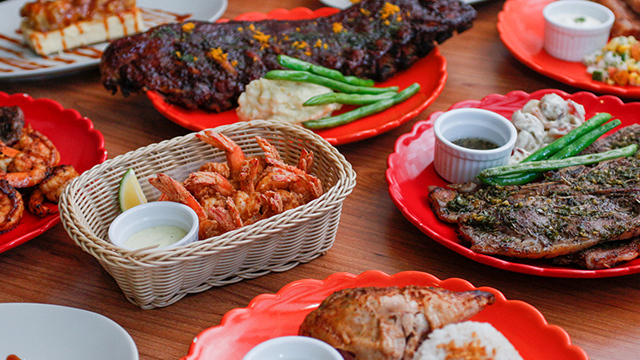 In a city where hundreds of restaurants are competing for your attention, Sobremesa stands out for its cozy ambience and familiar flavors. It’s the kind of place you’ll find yourself coming back to again and again, each experience even better than the last.